We know the importance of the tools and inventories in various engineering purposes. Easy availability of certain inventories and tools are necessary for the perfect and precise work. Operator enjoys handy tools for efficient outcome. We manufacture and export perforation trolley and bin trolley. Perforation trolley is provided with flanges and reinforcing stripes. 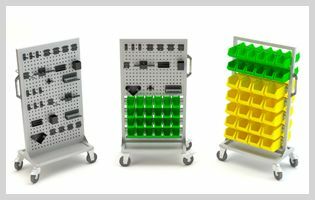 It contain many hooks to place the tools like spanner, scpaer, files, drivers, cutter, Allen keys, power tools and wrenches. The assembly process requires many tools and inventories. Person couldn’t be convenient with the work if every tool is to be picking from the tool room. Our perforation and bins trolleys save their precious working time and facilitate with handy and arranged kits before and after the job.